On the occasion of the annual meeting of the members of the Hellenic Cotton Association and the Izmir Commodity Exchange, MultiFreight will attend at the event of the “3rd MEDITERRANEAN COTTON ROADS”, held in Thessaloniki at the Hotel Nikopolis, both as a member of the Hellenic Cotton Association and as a sponsor. Cosco's container terminal subsidiary at the Piraeus Port Authority (PPA), managed by the parent company, posted another record over the Jan-Oct 2018 period, edging closer to the Chinese multinational's goal of becoming the biggest container hub in the Mediterranean. Specifically, according to the parent company, Cosco Shipping Ports Ltd., 399,000 Teu passed through the terminal in October 2018, up from 352,300 in October 2017, an increase of 13.3 percent. Overall during the first 10 months of 2018, 3,640,500 Teu was transported, up 19.1 percent from the same period in 2017, when it reached 3.,057,300 Teu. The results for Piraeus made it the top performer among ports managed by Cosco Shipping Ports Ltd. outside mainland China. The skyrocketing daily rate for LNG carrier hires, reaching as high as 220,000 USD from roughly 38,000 USD last May, has wetted Greek shipowners' appetite for new ship orders in the specific category, after a previous years' hesitation due to the high vessel construction and operations costs. According to Tradewinds, 50 new orders for LNG carriers will be placed by the end of 2018, with Greek shipping interests among the top buyers. So far, 44 new orders have been confirmed for 2018, with major "players" in the sector, such as Norwegian shipowner John Fredriksen and Shell group, expected to also place orders. Christos Economou's TMS Cardiff Gas has placed the most orders for new vessels in 2018, at eight from two separate shipyards. Fredriksen's Flex LNG is second, with Peter Livanos' GasLog third, with five orders from SamsungHeavy Industries. Vangelis Marinakis' Capital Gas is fourth, with four orders recorded. Minerva Marine has placed three new ship orders in 2018, along with Alpha Gas and NYK. Finally, another Greek-owned company, Maran Gas, placed orders for two LNG carriers. Multifreight attended the international transport and logistics exhibition, taking place at Istanbul. Logitrans is the leading trade fair for transport logistics in the Eurasian region, presenting innovative logistics solutions and a connecting point of the decision makers of logistics and supply chain management from Europe, North Africa, the Middle & Far East and CIS countries. We are glad to inform you of the new connection between Greece, North Italy, Central Europe & Turkey by 45FT containers, through the new service of UNRORO (DFDS Group) via Patras port. You can find the official announcement of UNRORO Line at the following link. Multifreight’s affiliated company Alpha Intermodal S.A is honored to be the booking agent of UNRORO Shipping Line (DFDS Group) in Greece. After reaching Trieste, by using block trains, which depart on daily basis, the containers can be at North Europe in a few hours. Mutifreight, using a fleet of 45’PWHC containers, can cover your needs ensuring high service quality, short transit time, as well as competitive costs. We will be pleased to provide any additional information you may need. We're happy to announce that Multifreight will participate as a sponsor at the 13th World Processing Tomato Congress, which will take place in Greece. Parallel to the main event, the 15th ISHS symposium on the processing tomato, will be hosted too, where the most recent research in all branches of horticultural science will be presented. These two events will be held for the first time in the Congress's history on a cruise ship and will last 4 days, from the 11th till the 15th of June. Over the four days cruise around the Greek Islands and Ephesus the participants will have the opportunity to attend many interesting topics related to the tomato industry, production and consumption, current market trends, technological developments and how they relate and shape the future of the industry. Additionally, there will be a post-congress tour which will give the opportunity to the delegates, to visit Greek tomato fields and factories. This optional tour is organized in a way that combines visits to major archeological sites along with tomato facilities. For any further information, about the program, the registration, the accommodation and the fees you can visit the event's webpage at https://www.13thworldtomatocongress.gr/. It was a great pleasure for us to have at our office at Thessaloniki the Eatern Europe Sales Manager of BATES CARGO PAK, mr Mario Bonora. During his visit at Thessaloniki we had the opportunity of discussing several matterrs & new trends about the cargo safety and new features of the BATES CARGO Airbags. The biggest vessel in recent memory to arrive at the port of Piraeus, Greece's largest and busiest port, is expected to dock at the port on Monday. 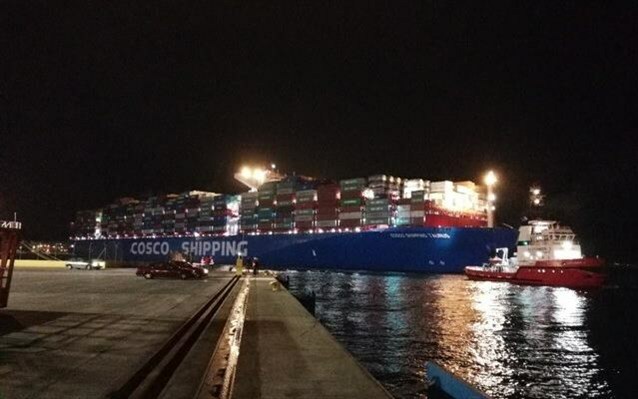 The brand new 420-meter container carrier "China Cosco Taurus" will arrive at Piraeus' pier III at some point during the day, inaugurating a regular route from China to Rotterdam. Greek shipowners have apparently taken possession of a greater share of the new ships that are scheduled for delivery in 2017, compared to other national blocs of owners, according to data supplied by VesselsValue to “N” this week. TOKYO -- Shippers increasingly are fielding immense vessels to cut the costs of transporting goods from Asia to Europe, but some fear the trend will keep freight rates at low depths.